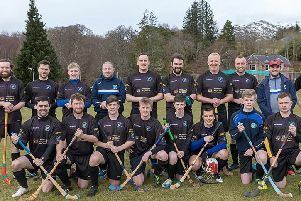 On the final evening of the 2014 – 2015 season Stornoway Bridge Club managed to play the last remaining competition which was the British Legion Teams. The teams were formed based on the players’ performance throughout the season and made for a pretty balanced evening. In Team 1 there was Norah MacDonald and Murdo Kennedy and Gerda Graauwmans and Jenny Morrison, Team 2 was Derek MacKenzie and Jean MacLeod and Iris Stewart and Sylvia Taylor, Team 3 Rita MacDonald and Janet Smith and Liz Carmichael and Jimmy Ogilvie , Team 4 Irene MacKenzie and Harris MacKenzie and Norman MacDonald and Stewart MacDonald and Team 5 Colin Scott and Bryan Harris and Ken MacDonald and Dave Gormley. If the handicapped system worked then everyone was playing at approximately 50%. There were four rounds of six boards. At the end of the evening they had their winners and they won by a reasonable margin with 55 VP’s. Congratulations to Team 4, Irene, Harris, Stewart and Norman. It was a fitting end to a very good season for Stewart and Norman and a lovely reward for Irene and Harris who have fought hard all year for a trophy. In second place was Team 2, Derek, Jean, Sylvia and Iris with 46 VP’s. The final match of the season meant that Jean managed to play her 10th competition (in Stornoway) this year. It was also the last time that Sylvia was to play with them on a regular basis as she moves to Glasgow shortly. In third place was Team 1, Norah, Murdo, Gerda and Jenny with 39 VP’s. There were two further trophies to be awarded, the NL MacDonald Trophy, which takes the pairs best 10 scores of the season, and the ‘Player of the Season’ trophy (new this year). This trophy requires a minimum of 10 competitions to be played (with any partner) and takes an average over the whole season. The NL MacDonald Trophy has been won by Stewart and Norman with a score of 113. In second place were Ken and Dave with 109 and in third place Rita and Janet with 106. The ‘Player of the Season’ was Norman with 59 points and the next 2 players both had 57 points with Dave just taking second place over Derek. Thank you for another fun-filled year and see you in September!